I’ve always complained from the armies of young children usually present in every movie I go to in Kuwait. Either teenagers who would yell, scream, or think they enriching the movie experience with their vulgar catcalls or the babies or toddlers who scream bloody murder or get bored and start whining. The last movie I went to before Cinescape enforced the movie ratings in accordance to the ministry of information’s new law, was Mama. Well, Mama is a horror movie. It’s so scary I kept my eyes shut and almost whimpered. But the title says Mama therefore parents thought it was OK to bring their unbehaved children along to watch. 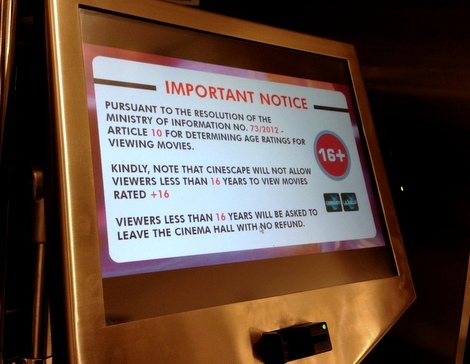 Then Cinescape enforced the 16 years old and over law and I had my doubts, how strict will Cinescape be when enforcing that law exactly? Then we went to see A Good Day to Die Hard, a 16 and over movie, and to our surprise and sheer happiness there weren’t a child in sight! All viewers were adults, all over 18, the segregated bachelors section was completely empty. Is it because of the law? I truly hope so. During the movie the man behind us was explaining every move to his wife who couldn’t understand the movie, he was loud and obnoxious, and when we left the “adults” had kept their garbage behind. The empty movie seats worried me though, would Cinescape really go through with enforcing the 16 and over law even though it clearly means a huge loss of profit for them? If every movie runs half empty, would that mean on Cinescape would have to compensate by raising its prices? and how long would it take before enforcing the law would be too much trouble and the young ones would be allowed back in? I wonder why 16 and over though? In the UK the rating is 12, 12A which is for 12 years old if accompanied by an adult, 15, and 18. Mama for example should have been 18 and over but a good day to die hard could have been a 15 and over movie? Actually in the UK its rated as 12A and I clearly remember when I turned 12 I was in London and my aunt took me to Whitelyes to celebrate with a big ice cream sunday and then watch the Batman movie -the one with cat woman- which was a 12 and over movie! Perhaps the movie rating system would be easier to enforce and more profitable for Cinescape if there were more age groups to rate movies with? Just saying, for I remember when I was a teenager and addicted to movies and how I wanted badly to watch a movie I’ve been waiting for but it belonged to the older age groups. The silver lining of growing older back in the day was the freedom to watch more movies from older age group. All in all, thank you Cinescape for such a bold and brave move. It yet remains to be seen whether or not this age restriction would remain enforced in the future. But what about the underage kids who come in families, will they not be allowed to watch the movie? As cinescape said those kids below the mentioned age will not be allowed to sit in the hall neither will the tickets be refunded. I don’t think they can do much if it’s a family case because if the kid has to go then probably rest of the family will leave too. So let them leave. It states everywhere, at the website, at the kiosk where you collect the tickets, at the ticket office, that under 16 years old will not be admitted and their tickets will not be refunded. Ignorance is not an excuse in this case and the rating is 16, not 16 A so being accompanied by adults will not do. If they did get their tickets regardless thinking they will just slip through, its their problem not Cinescape’s. I just hate the law and all that it represents to be quite honest, please don’t get me wrong I hate the under age movie hecklers, people who bring toddlers to movies, and parents who are out right ignorant and oblivious to the movie they bought tickets to. But this is a government enforced law, cant they think of a more creative way to raise awareness??? Cant they work with cinescape and come up with a better solution? Having age restrictions on censored movies is like covering up an already covered Image .. wuts the point? Age restriction on censored movies… nice point you have there. But if you put aside the censorship which only extends to romantic gestures and/or kissing and beyond scenes, there isn’t much that is censored. For example, brutal violent killing scenes or horror scenes or strong language isn’t censored and aren’t suitable for young children. If parents think of the cinema as a place to dumb their children and let them spend a few hours without being bothered by them, sadly the law must intervene and decide which movies to be watched. I’ve seen kids as young as 8 go to the movies by themselves. But I do agree that some awareness should be raised for the population. Some people do not understand why a movie can’t be suitable to a child and even if it isn’t, its the motto “3iyali o kaifi!”. I personally think they might want to redefine the age limits into categories like the UK with PG, U, 12, 12A, 15, and 18. At least it will give the parents more options to send their kids away or watch something with them and they won’t have to try and ignore the law as usual. I Totally agree with wut you said in terms of censorship although I disagree on the gruesome and disturbing image part, as KNCC has always opted to not even screen movies with too much violence (eg. Django, Zero Dark Thirty to name a few), but I guess my point is redefining the problem and choosing a solution that suits the problem at hand. Our problem isn’t keeping underage kids out its actually ignorance and parents mis-understanding movies, we should fix that problem. I just feel that parents with well disciplined teens will be punished by this law, I have cousins aged 14-16 with really conservative parents that filter out wuts good or bad for them to see ultimately chaperoning them when going to a movie, and on the other side cousins with more liberal parents who do monitor and supervise but give their kids more freedom in terms of movies and literature, so it’s the ultimately the parent’s choice. You can enforce laws and rules, I just think they should be well thought out and planned in solving the actual problem at hand. So ok on the age restriction (you convinced me there) … just re-structure it like the UK one. Do they? I mean Texas chainsaw is horrible, I can’t even go through the first movie, but it was open with all its gruesomeness to every kid out there. Sometimes MOI would censor movies with political messages “The Kingdom, Argo” or mythical basis “The Titans movies, Prometheus, One of Twilights’s, etc.” and even though that’s unfair and insulting, now with the age groupings perhaps they would somehow reconsider their censorships decisions. Maybe, hopefully, but really don’t think so. Sadly you cannot make ignorant parents see right, but you can impose a law to restrict the damage they cause by neglecting to follow up on their children’s activities and perhaps because of this law they would start to pay more attention to what their children are watching, or their whereabouts in the first place. It will be fair to all if and only if its correctly imposed. But in order to do so you have to cut the movie goers some slack and allow them to watch something other than the movies they absolutely cannot get into and not something lame like a childrens cartoons only. This is why I love your blog … intellectual, funny, extraordinary, and something a Kuwaiti gal such as myself can relate to. Mashkooora 3al your articles and your lovely Blog. About the rating… I posted about an incident that I witnessed! Yesterday I was in Snitch and the new restriction message came on the screen and the kids were like “Y3ni n6l3 el7een” followed by a big fat mocking laugh. Snitch wasn’t 16+ though so no one would pull them out. I think I may start going to 16+ movies only from now on! I went to die hard in 360… there were a bunch of children and an infant who kept crying during the movie. While I agree with the idea but for parents like its all over. We cannot go for the movie because we have a toddler who cannot be left behind. We cannot afford maid and have no family here. our kid is well behaved and would normally watch her cartoon on an iPad using headphones. So goodbye to movies for us for many years. Your kid is well behaved but others aren’t. The same thing will happen to all parents who can’t leave their kids at home, all over the world and no just in Kuwait, including myself when I have a child. There are plenty of other movies to see and only the very violent or the horror ones are currently marked 16+.